Miriam K. Smith, a young American cellist, is rapidly gaining recognition as a concert soloist. She made her orchestral debut at age 8 playing the complete Haydn Cello Concerto No. 1 in C Major with the Seven Hills Sinfonietta. 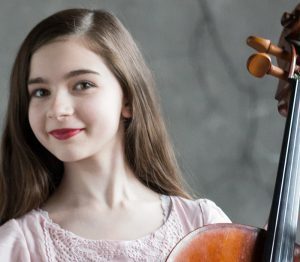 Recent engagements have included her debut with the Cincinnati Symphony Orchestra and Louisville Orchestra playing Tchaikovsky Rococo Variations for children’s concerts, and featured soloist with the Wright State Chamber Orchestra. Miriam opened the Wisconsin Chamber Orchestra’s 2019 Masterworks Series as the featured artist performing the Saint-Saëns Cello Concerto No. 1 in A Minor. While on tour she has done TV and radio interviews as well as private and public community outreach performances. She has performed in recital at Carnegie Hall twice as 1st place winner of American Protégé International and American Fine Arts Festival competitions, as well as the Cleveland Orchestra’s Rainbow concerts, and the 2016 and 2017 Emerging Artists series of the Green Mountain Chamber Music Festival in Burlington, VT. Her 2018 included solo recitals given in Cincinnati and Chicago, performing as concert soloist for an outdoor crowd of 40,000+ with the Wisconsin Chamber Orchestra’s televised Concerts on the Square, as well as recording her Global Music Award winning album – Ignite! Miriam has played in public master class for cellists such as Alisa Weilerstein, Peter Wiley, Richard Aaron, and Alan Harris. Ms. Smith’s primary studies have been with Sarah Kim and Alan Rafferty since she began cello at age 4.